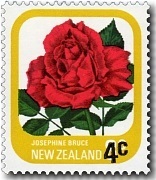 Virtual New Zealand Stamps: Provisional - Surcharges - Overprints. Here is another one of those types of stamps that are often overlooked or unloved, but it must be remembered that they still played an important role, filling gaps when other stamps were unavailable. Allan has asked me to go through his blog and collect them all together on one page. Most of the text here has been copied from his other posts but what is of more importance is to be able to view these stamps together as a thematic collection. I have also arranged these according to the date they were issued rather than include them in their original definitive issue, which in this case, would have left the arms overprints in their wrong positions. 1915 - George V War Stamp. While not usually considered a provisional stamp as such, this stamp does in some ways meet the requirements. First it was designed for a postage increase, in this case, a tax for the war effort. Secondly it was overprinted on an original stamp but in this case, there was no value as the stamps original value was still current. The halfpenny stamps were surface printed rather than recess printed to save costs. During the First World War, in 1915, a halfpenny war tax was introduced on all mail other than newspapers and the halfpenny stamp was overprinted 'WAR STAMP' to explain why postal rates had increased. ½d - 'War Stamp' on King George V.
1941 King George VI Provisionals. 1938 King George VI Definitives. During the Second World War, postal rates increased by ½d while stamp colours still had to meet the Universal Postal Union's requirements. To fill this role, the ½d stamp from the 1938 King George VI issue was surcharged 1d and the 1½d stamp surcharged 2d. This was a temporary measure to use up stocks until the stamps were printed in their correct colours without the surcharge, later in 1941. 1d Overprint On ½d Green. 2d Overprint On 1½d Chocolate Brown. When standard letter rates increased to 1½d in July 1950, it was realised that stocks of the 1938 King George VI stamp would be inadequate. An urgent order was placed for another printing from England, but to fill the gap until stocks arrived a provisional stamp overprinted on the 1931 Arms Postal Fiscals design was issued. Notice this overprint was done on stamps that had not been given any value, notice the blank panel at the top and bottom. 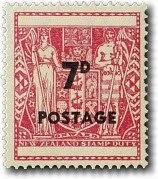 1½d Overprint On Red Arms. 1952 King George VI Provisionals. King George VI died on the 6th of February 1952 and it became obvious that stocks of the George VI stamps should be used up. In December of that year, an increase in postal charges was met by surcharging the George VI 1d green stamp 3d. 1d On ½d Brown (1953). 3d On 1d Green (1952). 1958 Queen Elizabeth II Overprint. Queen Elizabeth II - A Young Queen. The newer 1½d stamp with large figures had been on sale for two years, but a few sheets of the original 1953 issue were returned and some of these were accidentally surcharged as well. The 'Stars Overprint Error' can be easily detected on the right in the stamps below. The incorrectly surcharged stamps have the Southern Cross visible on the bottom right of the stamp. Given how cheaply the 1953 1½d stamp without overprint can be sourced, collectors should be extremely wary of forgeries. Compare the relative positioning of the obscuring bullet and the text, the character font used and the reflectivity of the ink against the correctly surcharged stamp - they should be identical. The gum side of the stamp should show indentations in the shape of the overprint. 2d Overprinted on 1955 1½d Brown. 1958 Queen Elizabeth II (Official) Overprint. 1961 Queen Elizabeth II Overprints. The 2½d surcharge on the 1955 3d red stamp appeared in 1961 after the definitives had been withdrawn and replaced by the 1960 Pictorials. When initially issued there was no 2½d stamp in the 1960 Pictorials issue and after another rise in postage necessitated a new stamp, the 3d stamp which the Post Office still had large stocks of, was overprinted to fill the gap. To meet the same shortage the 2d green official was also overprinted with a 2½d surcharge. When airmail postage rates increased from 6d to 7d there was no such stamp in the 1960 Definitives issue to cover this rate - the 7d Definitive not being issued until 1966. To fill the gap, the 1931 Arms Postal Fiscals die was used with no value printed in the panels at the top and bottom, but with 7d overprinted in black. The 1965 Sir Winston Churchill - Commonwealth Day commemorative also helped span the gap until 1966. Since this stamp was mainly used for overseas airmail, the bulk of used stamps left the country and so this case the used stamps are of more value than mint ones. In July, 2016, a mint copy would be worth $1.50 while the same stamp used is worth $3.00. See our post - 1967 Government Life Insurance Decimal Overprints. The 2½ cent stamps were surcharged in 1971 when postal rates increased and are usually listed under the 1971 Provisionals issue. There are three varieties of this overprint which are more fully explained below. Three varieties of 4c overprinted on 2½ Magpie Moth. Imperforated Photogravure. Perforated Letterpress. Local NZ Letterpress. 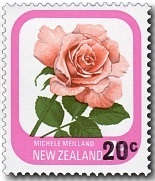 Stamps of half cent denominations were withdrawn in 1971 and the same year, the inland postage rate for first class mail was raised from three to four cents. This produced increased demand for the four cent stamp, while large stocks of 2½ cent stamps remained (previously the rate for second-class mail was 2½ cents and this had increased to 3 cents). Many sheets of the stamps both imperforated and perforated were sitting at the printer in England, while others sat in Post Offices around the country. The imperforate sheets were surcharged in England by photogravure (recess printing) after which they were perforated and cut into sheets in the usual way. This stamp has two thin horizontal bars and can be distinguished from the other two varieties by the high quality of the photogravure printing process and the screen dots which give the diagonal portion of the 4 a stepped or almost digitised effect under a magnifying glass. The stamps that had already been perforated at the printers could not be surcharged with photogravure as the gripping edges had already been trimmed so they had to be surcharged by letterpress (surface printing). This stamp is the most easily identified as the horizontal bars are thicker and fairly poorly printed. 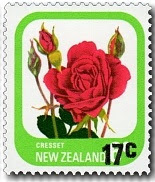 The stamps distributed around Post Offices were returned to the New Zealand Government Printer and surcharged locally by letterpress. The local print stamp also has two thin horizontal bars but can be distinguished from the recess printed stamp by the poor quality of the letterpress printing process. 7c Overprinted on 3 cent Lichen Moth. 8c Overprinted on 4 cent Puriri Moth. With the introduction of the 1975 Pictorials / Definitives stamp issue, the Post Office found that the new stamps were too large to fit in automatic stamp-affixing machines - such as the Postafix machine by Data Link Co, California. The1978 Coil Stamps solved this problem, but as an interim solution, supplies of the 1970 Definitives / Pictorials 3 cent and 4 cent moth stamps were overprinted by the Government Printing Office with 7 cent and 8 cent denominations and made up into rolls of 400 stamps. 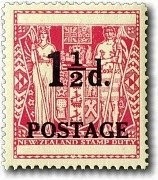 Some very crude forgeries of the 7 cent overprint were discovered by stamp collectors shortly after this issue was released - the intention apparently being to defraud the New Zealand Post Office of four cents revenue rather than fool collectors. They can be easily identified as the '7' surcharge is considerably smaller than on the valid stamp and the ink is dull compared to the gloss of the Post Office issue. 1975 Pictorial / Definitives - Part One. By 1979 the 1975 Definitives were getting older and some values becoming obsolete due to the continually rising cost of postage. Of course, rising postage rates meant new values were suddenly required so NZ Post once again turned to overprinting obsolete stamps. 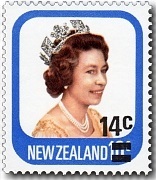 After 1980 New Zealand seems to have dropped overprinting stamps with new values. There was probably enough supply of the many commemorative stamps to meet a short-term demand. New Zealand Wine Post - Local Post. This blog prides itself on bringing something a little bit different to stamp collecting. Now Mary (one of our co-authors) has asked me to add something a little bit different to this post - provisional stamps produced by a local post. 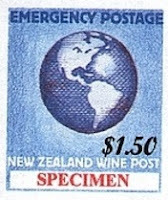 New Zealand Wine Post is a local post run by Weston Winery for, but not exclusively, the delivery of their wine and mail. They have been producing stamps for this service since it began in 1990 with both definitive and commemorative issues appearing on a regular basis. 1994 - Special Air Definitive. This stamp was only on issue from 7th Dec, 1994 until 25th Jan, 1995, when it was superseded by the new three state definitive issue. 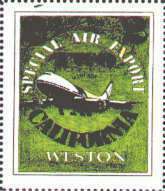 The Definitive stamps had a similar design of that Boeing 747 flying through the circle of text with minor changes of colour and text. 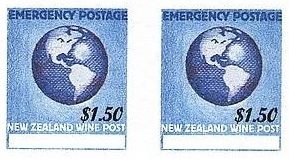 In 2006 there was a need for a $1.50 stamp for local mail within New Zealand. 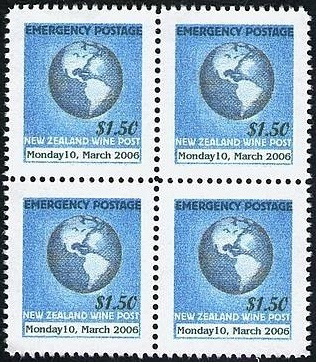 The Wine Post solution was to quickly produce a new design generic stamp that had a space for a date to be added at the bottom. Of course, the first issue showed 'Monday 10, March 2006' and was in used until the definitive issue of Oct, 2007. Now this was a rather clever idea because it meant that this design could quickly be pulled out any time a provisional was required. Unfortunately, as at 2016, this has never happened again. These two imperforated examples show a 'specimen' overprint on the left-hand stamp and no date overprint on the right-hand pair.